Join us for a journey with an authenticity that no venue in Dubai can match! Take a step back in time and travel in 1950s Vintage Land Rovers to a magical setting nestled inside a Royal Desert Retreat. Witness a spectacular falcon show while the Arabian sun sets and hear stories about Ramadan and the cultural heritage of the UAE from a local Emirati. 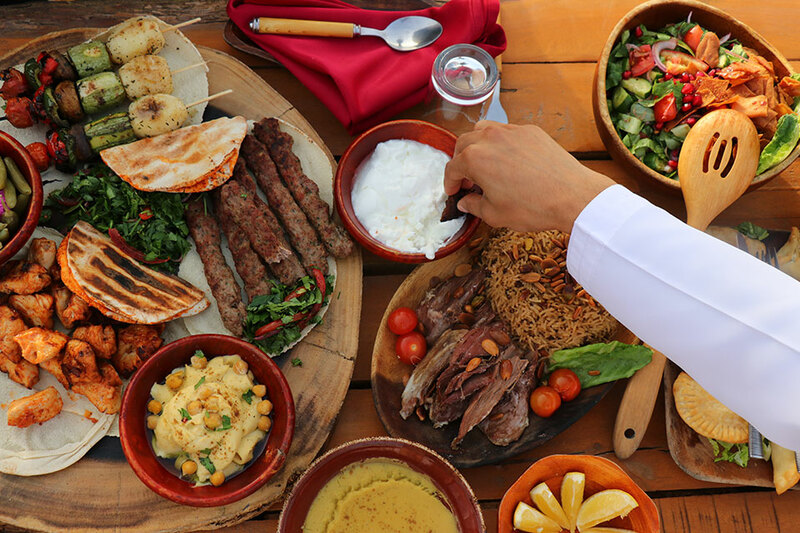 Arrive at an authentic Bedouin camp and spend an evening mingling and bonding with your work colleagues over delicious traditional Arabic dishes under the starry Arabian night sky. Relax in our traditional majilis and connect with colleagues over quality shisha and immerse yourself in the true spirit of this special month. Enjoy cultural activities such as camel rides, traditional Arabic bread and coffee making, henna tattoos and more. Engage in a cosmic journey with our complimentary Astronomy session and learn about the stars of Arabia and how the Bedouin used them for storytelling and navigation. This is so much more than a standard Iftar, it is an immersive experience in the cultural heritage of Dubai and a team bonding opportunity like no other, created in the true spirit of Ramadan. For larger groups we offer upgrades and value-ads depending on the group size. Please see finer details below for more information.